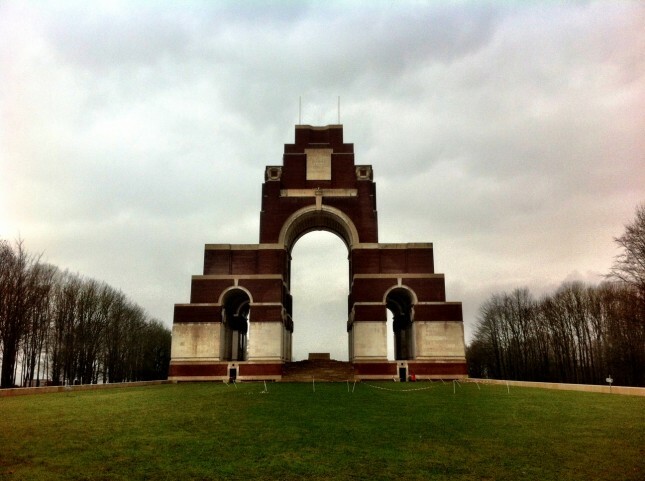 Today’s sightseeing tour was to be a sombre affair, a wander through the battlefields and memorials of the Somme, the infamous setting for the bloodiest battles in British military history. I started the day in the town of Albert, in the Picardie region of Northern France. Albert is home to the Somme 1916 Museum, and I though this would be a good place to get some background history, and pick up a map to guide me to some of the more notable landmarks. 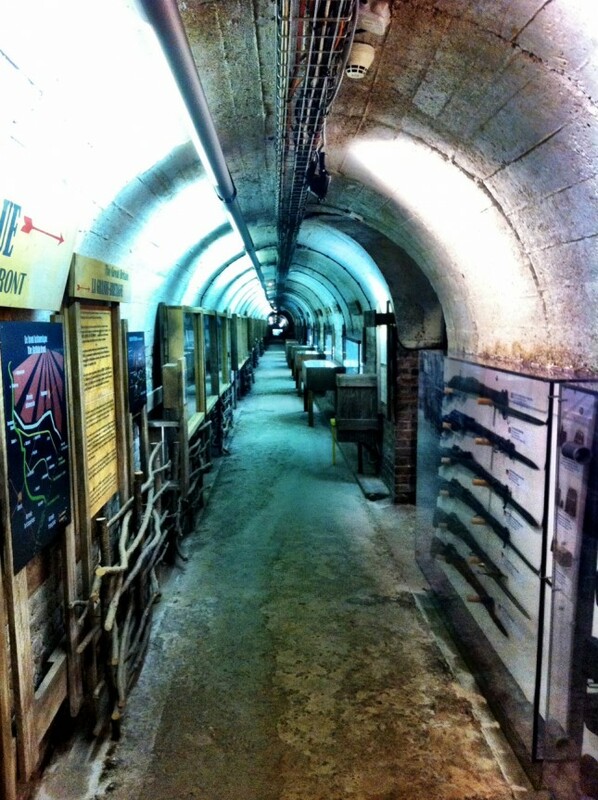 The museum itself is located in an underground bunker, one of 6 that were built before the outbreak of the war, as the nearby aircraft factory was considered a prime target should hostilities break out. This shelter starts under the town cathedral, and runs for some 200m under the town (somewhat disorienting as you come out the other end and wonder where on earth you are!) and was designed to accommodate 1500 people. The museum is filled with equipment and tableau giving an idea of what life was like on the front lines. Both German and Allied artefacts are covered, and there is a good written narrative along the way to explain all the bits and pieces. 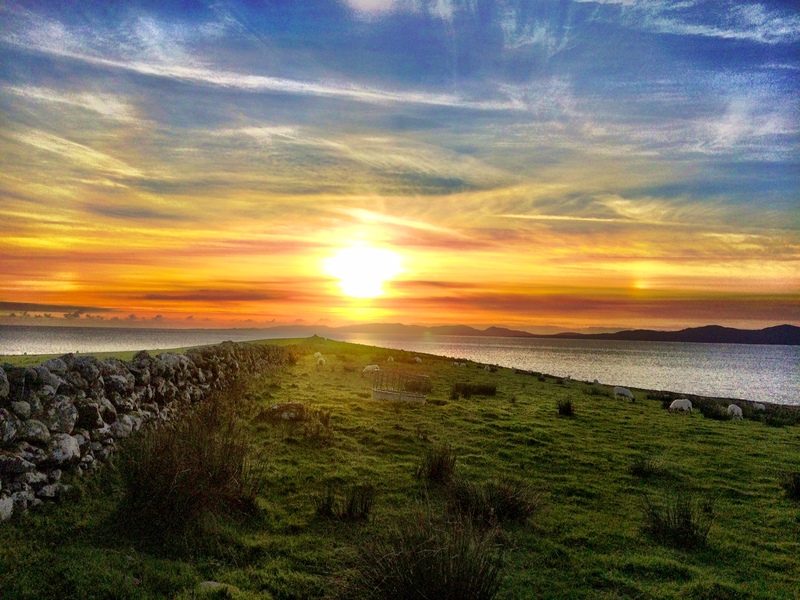 Apparently they are still unearthing 50 tonnes of unexploded shells every year, and they expect to do so for time immemorial, such was the volume of ordnance expended on the battles. 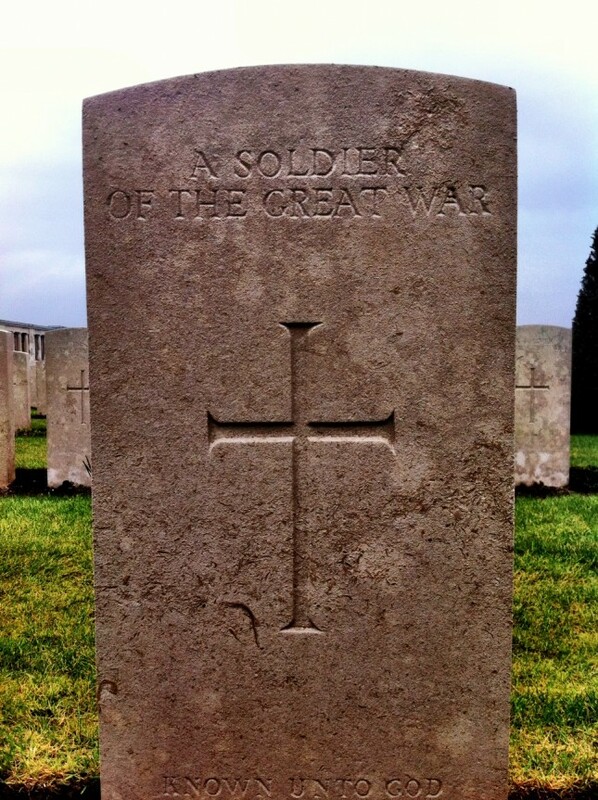 The first world war is notorious for the death and injury sustained by both sides, and the Somme was the focal point. As you cross the landscape, little changed in 90 years, it’s obvious how difficult the terrain makes it. Remember that in WWI it was still largely infantry soldiers and no mechanised transport. The broad open downland and occasional woods and small villages combined to create easily defendable positions but little way of crossing the open spaces without loss. Artillery and machine guns, recent technological advancements at the time had not been followed by advancements in mechanised troop movements or infantry tactics. As a result, both sides suffered tremendous losses. The Somme is most noted for the Allied Offensive of 1st July 1916. The front lines has reached stalemate over the previous year in the Somme region, neither side able to make advances. The British and France held the lines and created a joint plan to attempt to break through the German lines. Unfortunately in the lead up, the Germans mounted a campaign against Verdun which sapped the defending French resources, and so come the day of the push, it was mostly British and Commonwealth Forces leading the assault. At 7:30am on the first of July (zero hour), after 6 days of preparatory bombardment, the British went over the top and into no mans land. 60,000 were lost (20,000 killed) on the first day of battle, as the German defences had been little affected by the artillery, and their machine gunners were able to easily cut down anything that moved on the open ground. My second stop was at the memorial to the Newfoundland regiment. 40 hectares of the battlefield have been preserved as a memorial to the regiment, who lost 70% of their number on that first day, about 800 men. 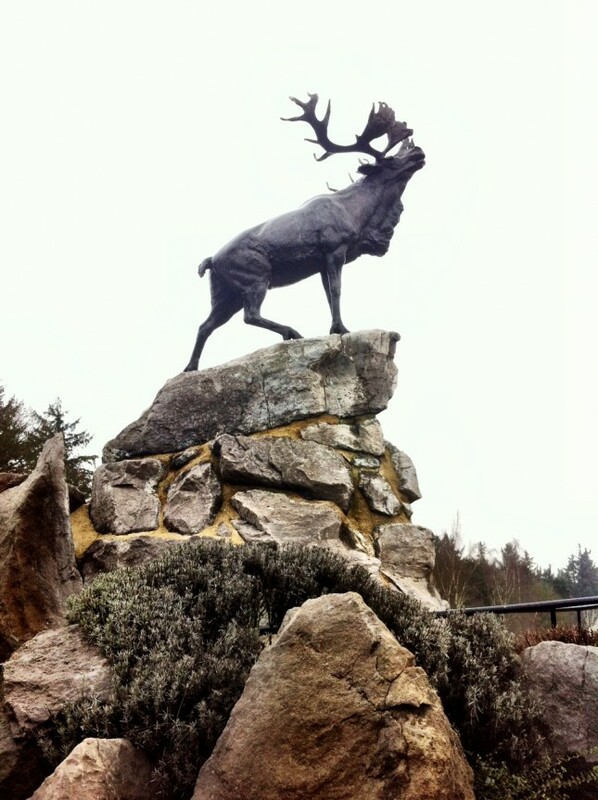 The site contains a number of memorials and cemeteries, and one of five Caribou memorials, which was the emblem of the regiment, as well as a number of the Allied and German trenches that cross crossed the landscape. The stretch of no mans land between the front trenches was only a few hundred meters, but somewhere that few escaped from once they had started their journey. Unfortunately due to the heavy rain yesterday, much of the site and all of the German trenches were out of bounds as there was too much mud. Ironic, given the picture most people would have in their minds at the mention of the Somme. Mind you, looking at some of the ploughed fields in the area, I don’t think I’d want to take a walk in some of them, let alone attempt to love and fight a war. An immense memorial dedicated to those men whose final resting place was never known. It bears the names of 73,367 such unfortunates. The visitor centre has a good pictorial and written history of the war and a timeline of the major events. The ridge on which Thiepval stands was one of the significant strongholds for the Germans, and a pivotal point in the war. A brief stop at this memorial and cemetery to some of the fallen British is alongside the road, enclosed by a stone wall, many of the headstones simply show ‘an unknown soldier’. One of the allied tactics prior to the 1st July offensive was to tunnel under the enemy trenches and lay large quantities of explosives, in the order of 15-20,000 pounds. Just prior to zero hour, a series of massive explosions were triggered along the German lines, with the hope of creating breaks, reducing numbers and spreading panic amongst those that remained. 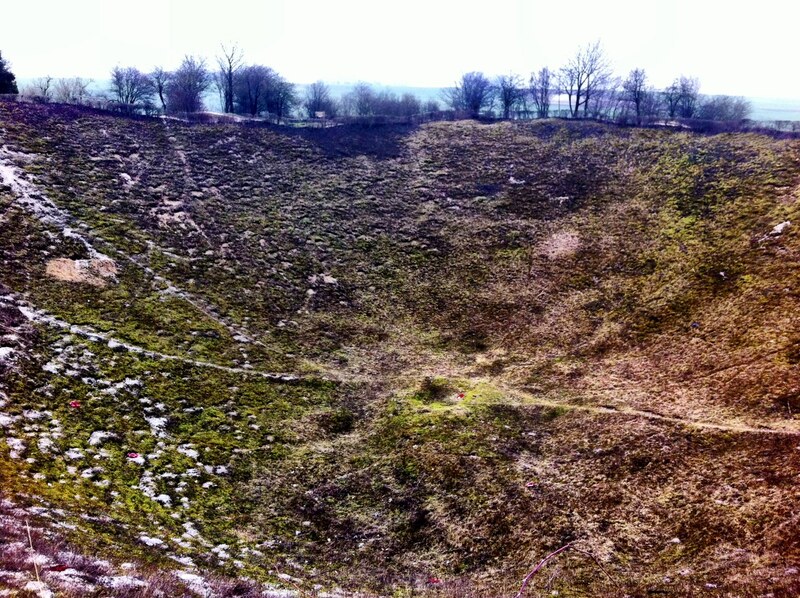 The Lochnagar Crater is preserved, and has a diameter of 100m and a depth of 30m. An immense hole in the ground, but a tactic that did not create the advantage that the Allies hoped for. It’s been an interesting day, I found out lots that I didn’t know before about the war, the conditions in which it took place, and the reasons for the significant loss of life. Whilst its impossible to debate the relatives merits of battle tactics, you do really have to ask whether there was not a more rational way of working out the differences than quite literally throwing people at it. I suspect however the egos of those involved mean that even today, we couldn’t trust our leaders to remember the lessons taught in such harsh conditions nearly 100 years ago. I’m off to Auschwitz next week, so it’s going to be interesting to compare the experience. Not that the two are comparable events, the motivations were entirely different, but it’s difficult to put such tremendous and senseless loss of life into context without something to compare it with.